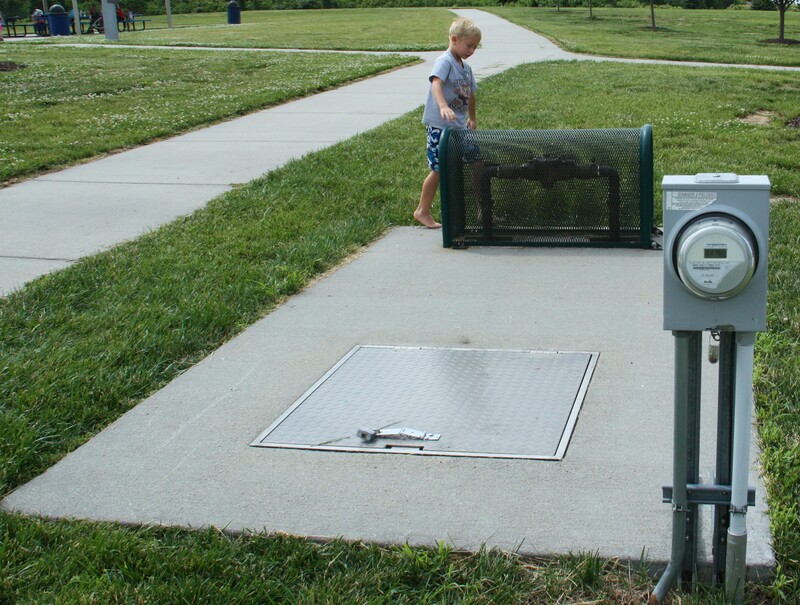 A 16-month-old Elkhorn boy is recovering from 2nd degree burns after running after a ball and stepping on a surface steel grate Wednesday at the Stone Ridge Sprayground, located next door in the neighborhood northeast of Elk Creek Crossing Omaha. In an exclusive interview today with ECC, the toddler’s mother Lindsay Warren updated her little boy’s condition. “My son Broch is doing okay today. His feet are blistered, but he is recovering. Looking back it was horrible to think that something so hot and dangerous was not covered. Every child that goes to the water park is barefoot is my concern, too,” said the toddler’s mother Lindsay Warren, wife of Scott Warren of Elkhorn, who own Absolute Customs, Inc. The incident happened in a blink of an eye. As mother watched, she reports, the toddler’s beach ball rolled about 30 feet from the Sprayground. “When my son picked up the ball, he froze on the steel grate. He started crying uncontrollably. His feet were blistering like crazy. I rushed him to the ER,” notes Lindsay. The mother hopes Celebrity Homes, the S.I.D and the law firm that manages the privately-owned Stoneridge Sprayground property in Omaha does the right thing, pays for her son’s medical bills and takes immediate steps so other children don’t get hurt. “It’s completely unacceptable that there was no sign, no warning,” said Lindsay. Previous Neighborhood Garage Sales Th-Sat!